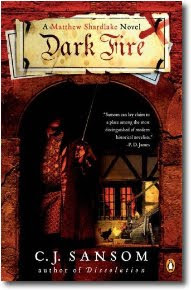 Dark Fire is the second in the Matthew Shardlake series by C. J. Sansom, but is also a stand alone novel in its own right. Matthew Shardlake is a Lawyer in 16th Century London and is persuaded (against his will of course) to serve the interests of Lord Thomas Cromwell in exchange for a stay of execution for an innocent girl being held in The Old Bailey. It is claimed that a barrel of Greek fire (commonly referred to as Dark fire, hence the title) has been discovered in a Church, hidden for 100 years together with the formula. Lord Cromwell has informed the King, who of course wants to get his hands on this weapon of mass destruction and terror so that he can use it against his enemies. Soon those who claimed to have discovered Greek fire are murdered, and Shardlake begins to investigate on behalf of Lord Cromwell. Meanwhile, the bodies pile up and his enquiries take him to all over the city from the heights of society to the stinking inns, alleys and brothels of London. While Sansom has taken liberties with plotting the discovery of Greek fire in London at this point in history, Greek fire did exist in the Byzantine era and was a devastating weapon. The formula was closely guarded and has been lost over the centuries. Even today, the composition of Greek fire is not known. For more information, click here. I guess this novel would fit into the genre of medieval crime if anything else, and I thoroughly enjoyed it. Dark Fire is a terrific read and C. J. Sansom is an author to look out for.